Just a note to tell you that Omar didn’t deliver my Harley on Sunday as expected. I guess that things just happen. He called me at 10:30 Saturday morning to tell me that he was about 2 hours away from Glendale and could I take delivery around 12:30 Saturday afternoon? You bet I could! Omar was a gentleman and yes, he had a first rate trailer that was custom made for delivering motorcycles. He had about 6 other bikes in the trailer that he was going on through to California to deliver. He seemed fine with the pre agreed delivery fee and called me a ‘gentleman’ for the extra $50 that I gave him for taking care of my bike so well and for the quick delivery. Getting the bike on Saturday instead of late Sunday, as expected, allowed Debbie and I to jump on the bike and take a 150 mile loop ride up through the back hills of the Phoenix Valley in our 83 degree sunshine. What a pleasure it was to be out on such a beautiful bike! MANY thanks to you, Sonia, for holding my hand while walking me through the shadows of the transport business. 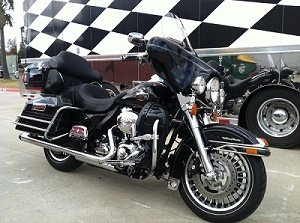 I am still getting e-mails from haulers who want $775-$950 to bring my bike to me. The $680 I paid was reasonable to me. $800 – $900 and waiting up to 6 weeks just seems unjustified. I am glad that you know what is sensible and could arrange my transportation accordingly. I have attached a couple of pictures of our bike, so you can see why I wanted it carefully taken care of. These are pictures from Cowboy Harley. I couldn’t find a bike near me that was worked over a nicely as this one, and I am grateful that you were able to make it safe for me to do an internet purchase. This entry was posted in Reviews on February 6, 2014 by Sonia.